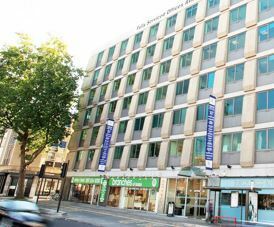 Temple Gate serviced offices in Bristol is located in the town centre close to the train station. The Business Centre has been fitted out to a modern standard and is equipped with all the latest in technology including video conferencing and AV equipment. At the entrance to the building, there is a professionally staffed reception with a waiting area, which leads to the lifts that access each floor. Offices for rent are offered with all-inclusive packages, which include Internet and phone lines with free calls to UK landline numbers. Telephone handsets are also supplied and suites are fully furnished with workstations and storage. The building is accessible on a 24-hour basis and security swipe cards are issued for easy entry out of hours. With communal kitchens and break areas within, this workspace also has a secure car park adjacent to the property.